These awards were created for the Coins Foundation 3 Peaks Challenge. 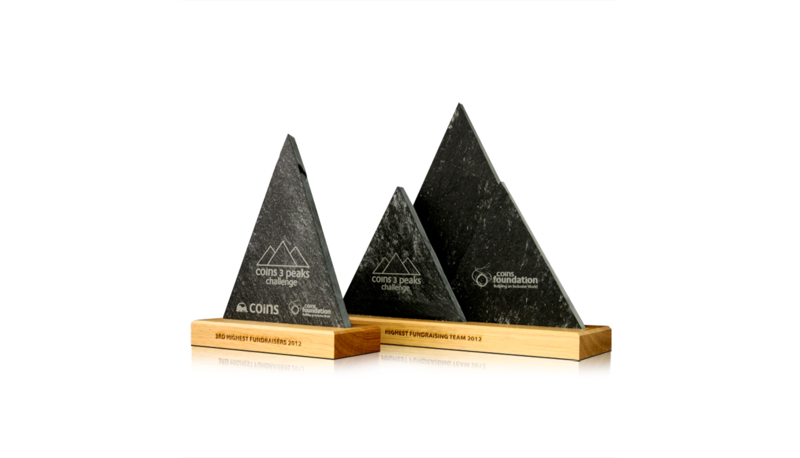 Crafted using profiled slate, these innovative awards are truly aesthetically appropriate, creatively incorporating the company branding. Set in a smooth wooden base, these awards stand upright, and their complete design resembles a mountain range. Using laser engraving, awards can be personalised for appropriate branding. These exquisite awards are completely unique, designed and created by Gaudio Awards.